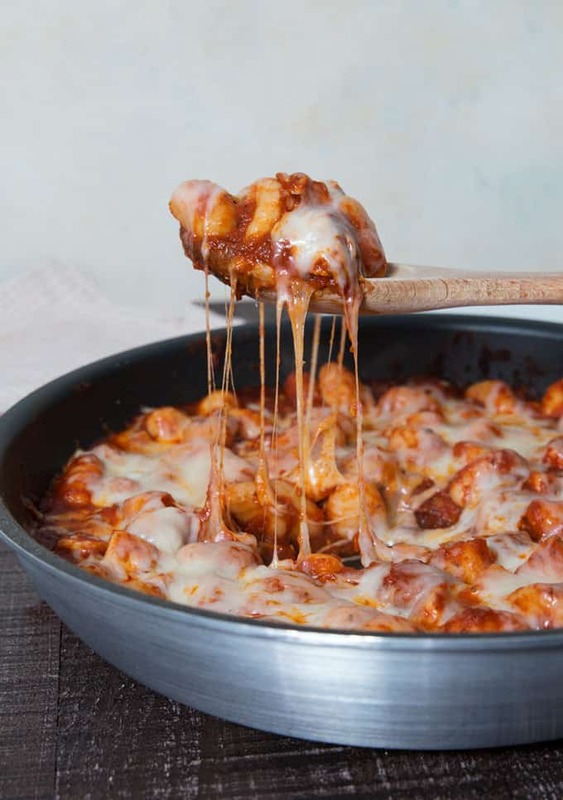 This one pan cheesy gnocchi is perfect for those nights when you have to get dinner on the table quickly! 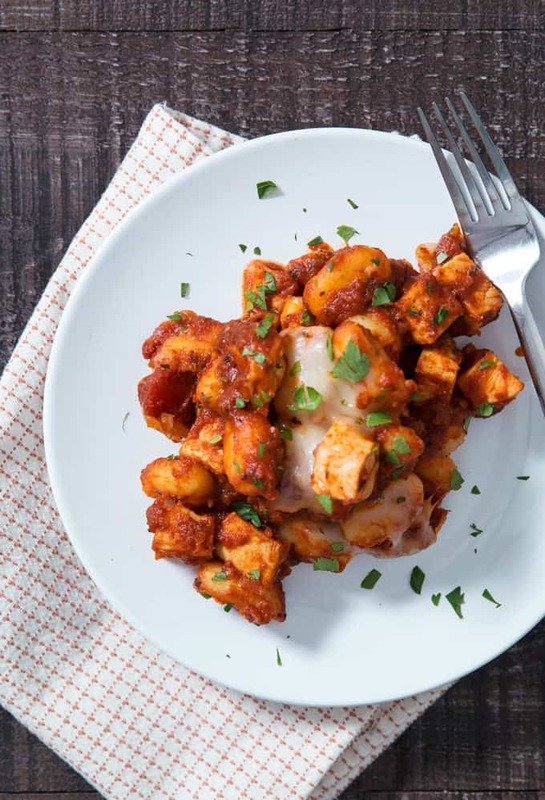 Gnocchi, chicken, cheese, and spaghetti sauce make this dinner easy to make and delicious! This post is sponsored by RAGÚ®. Thank you for supporting the brands that we love! All opinions are my own. Gnocchi is an ingredient that I just don’t use enough. I always think of pasta right away; for example this chorizo rigatoni casserole recipe. But gnocchi, how I love you. You cook quickly and are the cutest little dumpling. 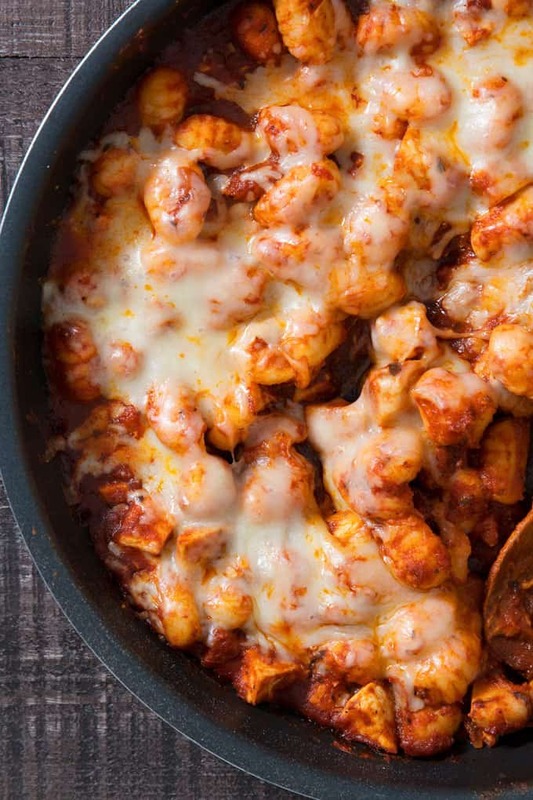 But seriously, gnocchi cooks very fast and is perfect for quick dinners and one pot meals. 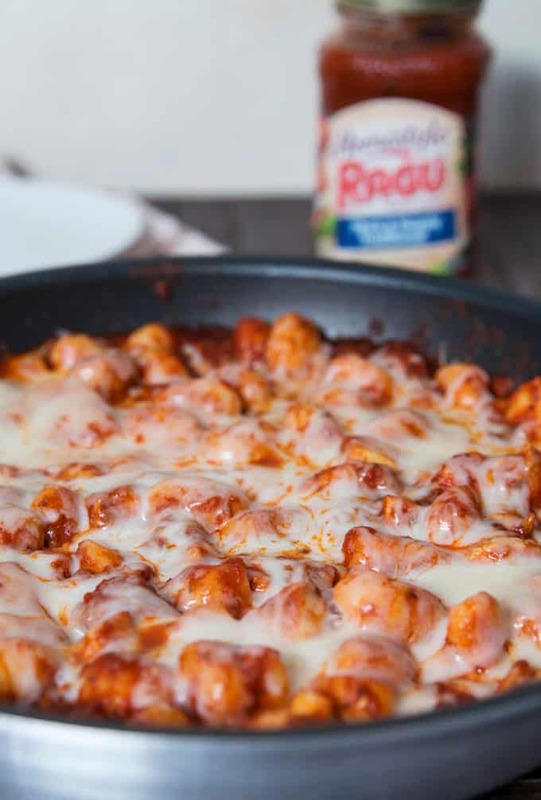 Add a little chicken and cheese, plus RAGÚ® Homestyle Thick & Hearty Traditional Sauce and you have the perfect dish. RAGÚ Homestyle sauces feature a thicker, heartier sauce. It is carefully prepared to have a thick, hearty texture that hugs the noodles. Or in this case, the gnocchi. 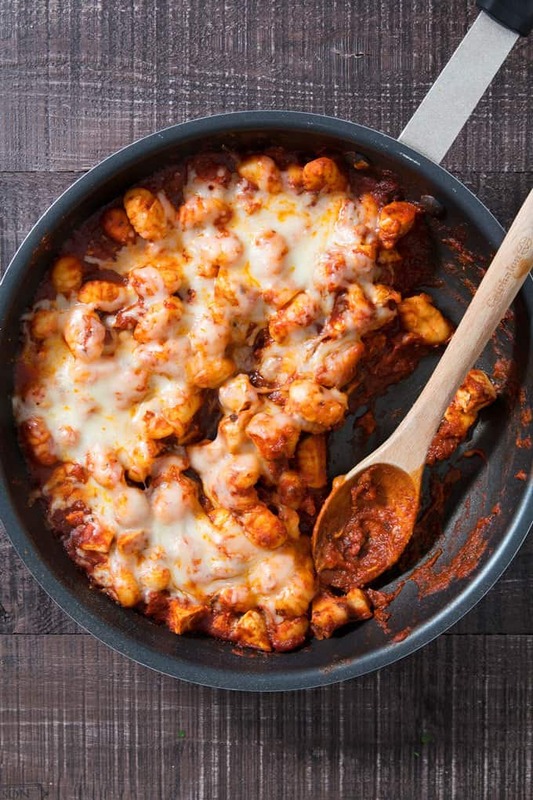 To get started making my one pot cheesy gnocchi recipe, you will want to dice up some chicken breast and mince some garlic. Heat a little olive oil in a pan and sauté the garlic. Then add the chicken and cook it all of the way through. I like to cut my chicken into small pieces for one pot dishes because it cooks faster that way. I look at one pan meals as a way to speed up the cooking process, whether it be the actual cooking or the clean up afterwards. 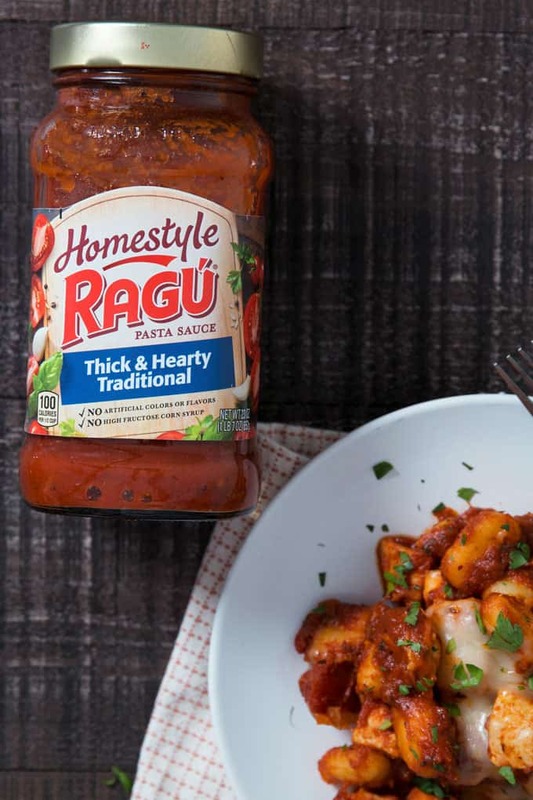 Once your chicken is cooked, it is time to add the RAGÚ Homestyle Thick & Hearty Traditional Sauce. Bring this to a boil – it won’t take long if you are using a shallow pan so keep an eye on it. 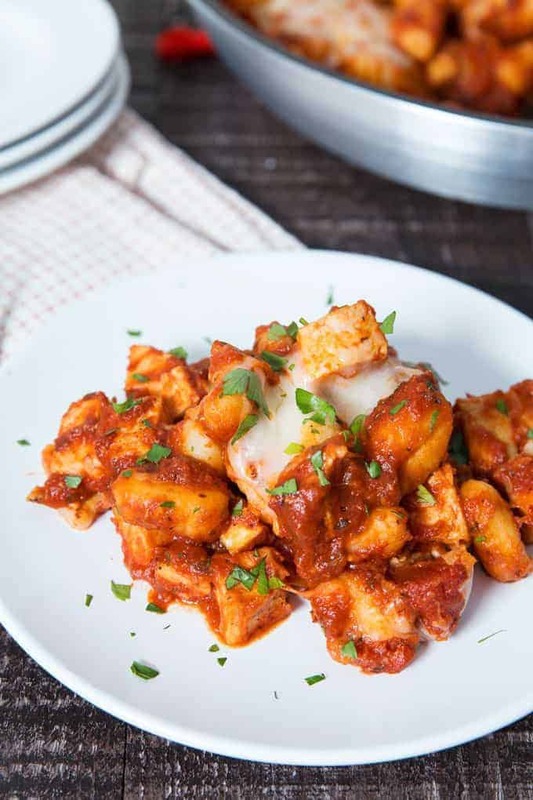 Once the sauce is bubbly, carefully add the gnocchi and stir it well so that each potato dumpling is completely covered in the spaghetti sauce. Then liberally sprinkle mozzarella cheese on top. Place a lid on the pan and let it cook for about 5 minutes. Take a peak at your gnocchi package to double check the cooking time. Normally I wouldn’t recommend this, but I add 1 minute to the time listed for this recipe. You don’t quite get the heat or action from boiling sauce in a shallow pan that you do from boiling water in a pot. And we want that gnocchi to be cooked. When you lift up the pan lid, you are going to be greeted by wafts of delicious aromas. I have made this recipe many times and I’m still excited each time I lift up that lid. If you want, sprinkle some fresh parsley on top. Either way, serve it while the cheese is bubbly and your whole family will be thrilled. I wouldn’t be surprised if they ask you to make this again! Heat the olive in a shallow skillet over medium heat. When the oil is hot, add the garlic and saute for 1 minute. Add the chicken and cook until it has reached an internal temperature of 165 degrees F. Stir occasionally - cooking time should take between 7-10 minutes. 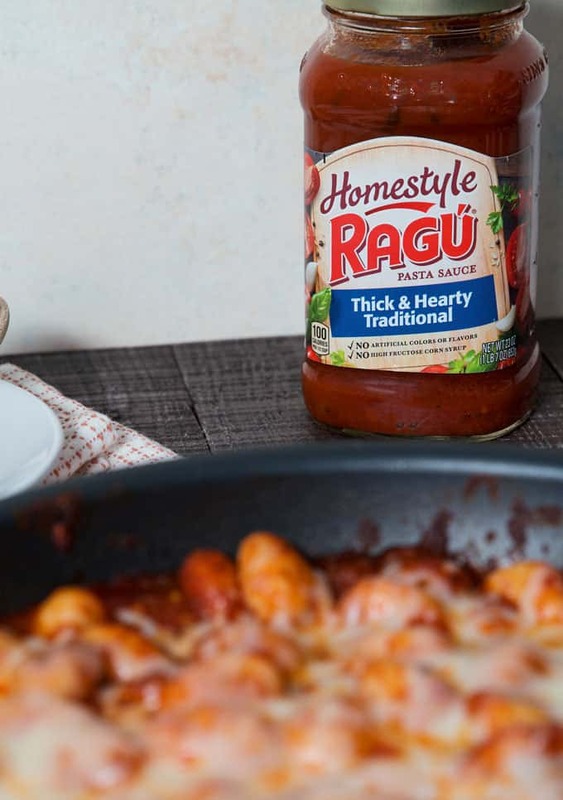 Add the jar of RAGÚ® Homestyle Thick & Hearty Traditional Sauce and bring the sauce to a boil. Then add the entire package of dried gnocchi. Stir well. 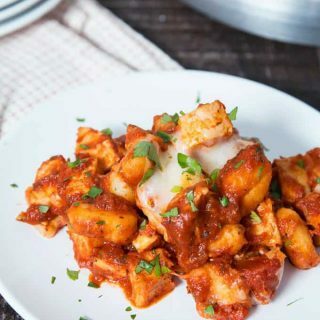 Sprinkle the mozzarella cheese evenly over the sauce and gnocchi. Cover the pan with a lid and let cook for 5 minutes. This is exactly what I’ll be making for dinner tonight! Thank you for sharing!! I love how easy this is to get on the table! The perfect, go-to recipe! I have made similar, but i add bacon lardons and creme freche to make the sauce creamy. The more cheese the better in my book! Looks perfect! This is my idea of the most amazing dinner ever!! Quick, easy and delicious – that’s always a winning combination! I do love a good one pan meal! This one looks so good! So beautiful, quick week dinner idea ! Thank you ! Could you subsitute ground beef for the chicken? I’m sure you could – I would recommend cooking it separately and draining the fat really well.